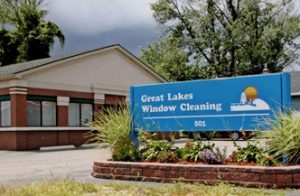 This position involves the cleaning of windows located on the first and second levels of Jackson and Ann Arbor area homes and businesses With training provided in Lansing. Lots of variety. Fun, interesting work. If you enjoy active, year round, outdoor (and indoor) work, being “out and about” at various locations and are comfortable on ladders this job may be for you! 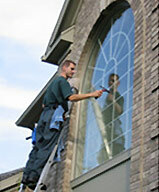 Pay starts at $14.00-$16.00 per hour depending on previous employment & ladder experience. With our bonus program this can grow to $18.00-$25.00 per hour or more with completion of advanced training and experience. We offer benefits with this position for full time employment. See details below*. Career training & education opportunities. Year-round work. Family friendly, flexible scheduling options. We are a smaller, family owned company so each person’s contributions matter. We depend on each person’s skills, commitment, and effort. We need hard working, enthusiastic, dependable, clean cut, dedicated, honest individuals who want to use their skills to help themselves as individuals and the company to grow. We are looking for people who are willing to learn, take pride in their work and will be generous in caring for each customer’s specific needs and requests. 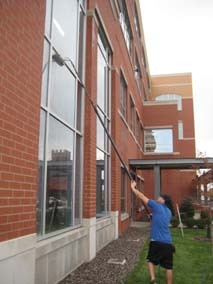 No previous window cleaning experience is required or desired – we will train you. Of course, we provide all tools and equipment. Ability to reach you by phone until you are issued a company phone. A smoke, marijuana and drug-free lifestyle, (a drug test may be required) if you choose to use tobacco or marijuana please don’t apply. The ability or willingness to learn to set up, move or carry a 24′ ladder and do ladder work up to 24 ft. Removal of special substances off glass. Great Lakes believes that there is more to a job than just a paycheck. Because we care about our people we offer benefits for all FULL TIME positions. Advancement opportunities include: job pricing and bidding, sales, and other expanded areas of technical work such as water fed pole cleaning, aerial lift work and high rise. Each of these areas is diverse and offers many ways to grow both personally and professionally for many years to come. Since we are a small company we encourage people to add skills in different areas within the company and advance as they feel comfortable. When coming to apply, please bring: Name, phone numbers, and dates from previous jobs. 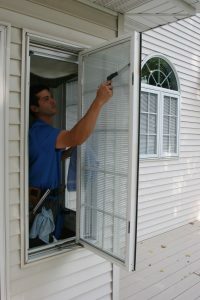 What I like about this company is the convenience of the online estimate option, the full service window cleaning, the courteous technician and his attention to detail.